As explained in the post About cloning..., when we talked about "surrounding DNA stuff", we were talking about epigenetics. Epigenetics is the study of changes in gene expression caused by mechanisms in the underlying DNA sequence, some of which are inheritable. In other words, we do not depend only on our genetic code plus the environment to be as we are, we have our "genetic environment" inside that makes us different. Epigenetics also allow our cells to be different among them. Our neurons will not express the same genes as our muscle cells, and that is determined by different processes. Methylation, for example, is a biochemical process that adds a methyl group to a C (cytosine) or an A (adenine) DNA nucleotide. That action silences the gene expression. 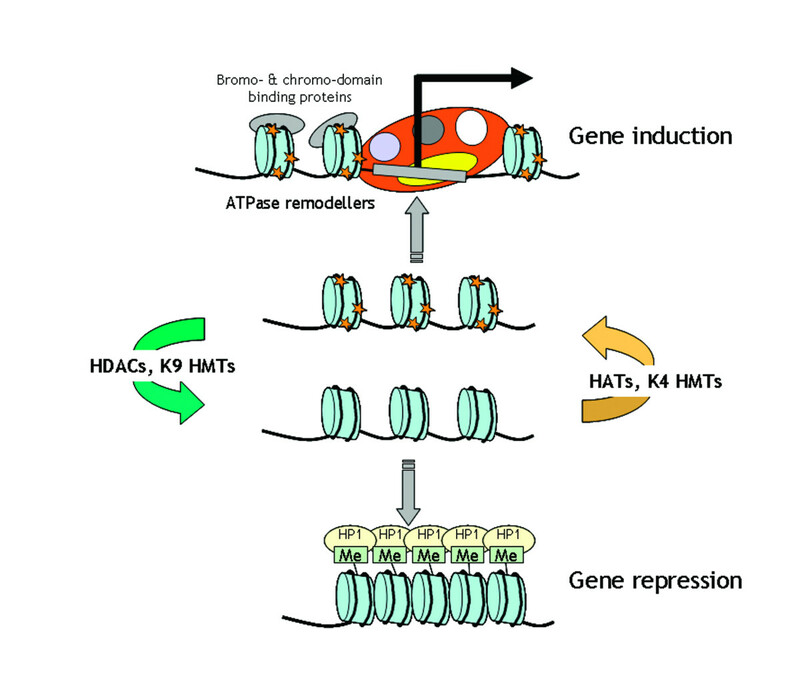 Something similar happens with the histone modification or the iARNs. 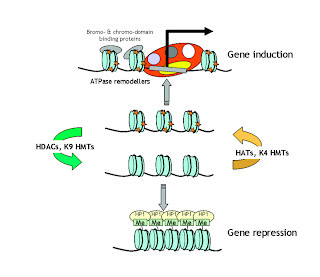 Epigenetics is a very huge field that nowadays is still being studied. For example, it is thought that maybe this process may affect evolution and adaptation. But we know for sure one thing, small changes may generate great differences. That happens in human diseases like Angelman and Prader-Willi and also in natural processes, like the determination of the gender in reptiles. Keep with us and don't hesitate to ask!